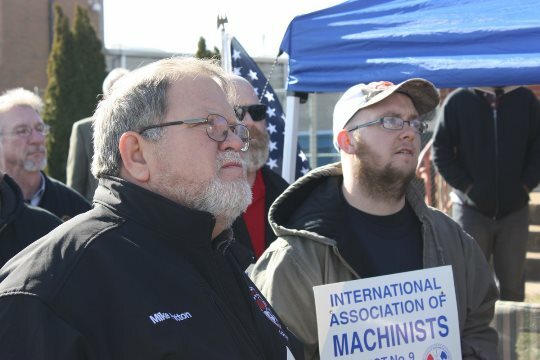 Nearly a hundred Machinists, labor union brothers and sisters, and community supporters converged upon St. Louis, directly in front of anti-union manufacturer American Pulverizer headquarters, to stand in solidarity with IAM Local 41 and 313 members on strike there. IAM leadership – International President Bob Martinez, General Secretary-Treasurer Dora Cervantes, Midwest General Vice President Philip J. Gruber, and Headquarters General Vice President Rickey Wallace – stood proudly among the ranks. 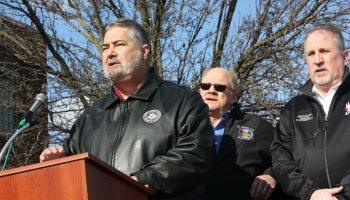 American Pulverizer forced the workers to go out on strike 12 weeks ago when negotiations failed over the company’s proposal to roll 87 percent of health care costs onto the members, offer minimal and inconsistent wage increases, take away premium pay for overtime, and not guarantee holidays off. The company also wants workers to use their vacation time for things like medical leave, FMLA, and time off due to workers’ compensation. In addition, American Pulverizer wants to strip away workers’ rights to take part in union activity and change the “management rights clause” to give the company the ability to arbitrarily change work rules as it sees fit. These recent egregious proposed changes come after contract talks in previous years where the company stripped workers of their IAM health and welfare and IAM pension plans. Contract talks, which reconvened in recent days, failed again this week. IAM District 9 has filed an unfair labor practice charge with the National Labor Relations Board, (NLRB). Hundreds of St. Louis labor unions and folks from the community have shown their support throughout the strike, including members of Gas Workers Local 11-6 and Teamsters Local 688 who have been bringing by food and firewood. Local businesses like the Humane Society and Boyer Fire Protection have let the striking workers use their facilities for storage and personal matters. See Rep. Clay’s full statement. The post IAM, St. Louis Labor Joins District 9 Strike Rally at American Pulverizer appeared first on IAMAW.